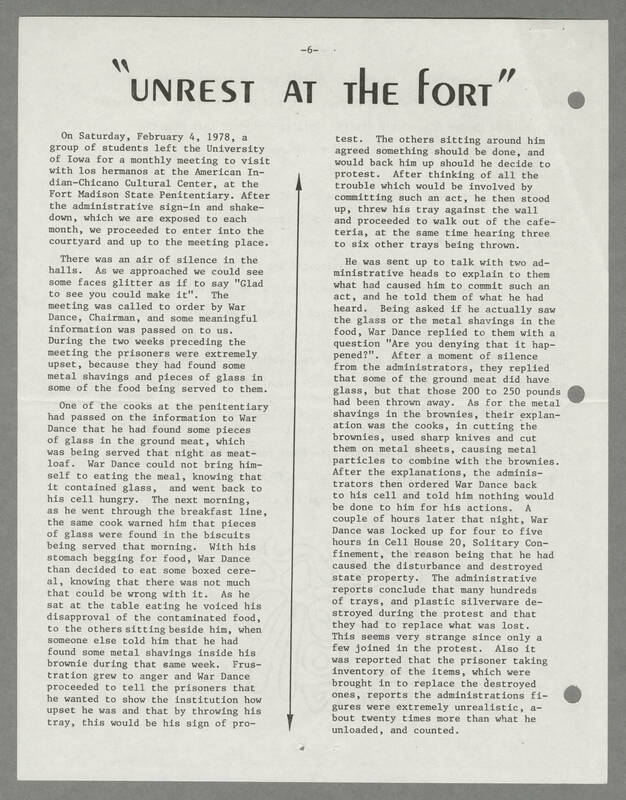 -6- "UNREST AT THE FORT" On Saturday, February 4, 1978, a group of students left the University of Iowa for a monthly meeting to visit with los hermanos at the American Indian-Chicano Cultural Center, at the Fort Madison State Penitentiary. After the administrative sign-in and shake-down, which we are exposed to each month, we proceeded to enter into the courtyard and up to the meeting place. There was an air of silence in the halls. As we approached we could see some faces glitter as if to say "Glad to see you could make it". The meeting was called to order by War Dance, Chairman, and some meaningful information was passed on to us. During the two weeks preceding the meeting the prisoners were extremely upset, because they had found some metal shavings and pieces of glass in some of the food being served to them. One of the cooks at the penitentiary had passed on the information to War Dance that he had found some pieces of glass in the ground meat, which was being served that night as meatloaf. War Dance could not bring himself to eating the meal, knowing that it contained glass, and went back to his cell hungry. The next morning, as he went through the breakfast line, the same cook warned him that pieces of glass were found in the biscuits being served that morning. With his stomach begging for food, War Dance than decided to eat some boxed cereal, knowing that there was not much that could be wrong with it. As he sat at the table eating he voiced his disapproval of the contaminated food, to the others sitting beside him, when someone else told him that he had found some metal shavings inside his brownie during that same week. Frustration grew to anger and War Dance proceeded to tell the prisoners that he wanted to show the institution how upset he was and that by throwing his tray, this would be his sign of protest. The others sitting around him agreed something should be done, and would back him up should he decide to protest. After thinking of all the trouble which would be involved by committing such an act, he then stood up, threw his tray against the wall and proceeded to walk out of the cafeteria, at the same time hearing three to six other trays being thrown. He was sent up to talk with two administrative heads to explain to them what had caused him to commit such an act, and he told them of what he had heard. Being asked if he actually saw the glass or metal shavings in the food, War Dance replied to them with a question "Are you denying that it happened?". After a moment of silence from the administrators, they replied that some of the ground meat did have glass, but those 200 to 250 pounds had been thrown away. As for the metal shavings in the brownies, their explanation was the cooks, in cutting the brownies, used sharp knives and cut them on metal sheets, causing metal particles to combine with the brownies. After the explanations, the administrators then ordered War Dance back to his cell and told him nothing would be done to him for his actions. A couple of hours later that night, War Dance was locked up for four to five hours in Cell House 20, Solitary Confinement, the reason being that he had caused the disturbance and destroyed state property. The administrative reports conclude that many hundreds of trays, and plastic silverware destroyed during the protest and that they had to replace what was lost. This seems very strange since only a few joined in the protest. Also it was reported that the prisoner taking inventory of the items, which were bought in to replace the destroyed ones, reports the administrations figures were extremely unrealistic, about twenty times more than what he unloaded and counted.